Ricardo Rozzi is this year’s recipient of the Science and Practice of Ecology & Society award for his team’s research activities at Omora Ethnobotanical Park on Navarino Island just off the tip of South America. Rozzi’s contribution to biocultural conservation in the Cape Horn archipelago is detailed in the article Omora Ethnobotanical Park and the UNESCO Cape Horn Biosphere Reserve by Eugene Hargrove, Mary Arroyo, Peter Raven, and Harold Mooney. Rozzi’s non-linear career path included studies in biology, philosophy, music, and a Ph.D. dissertation on indigenous knowledge of plants and birds in the Cape Horn archipelago. This transdisciplinary perspective appears to have formed the foundation for all of his work that has followed. 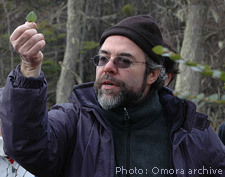 Ricardo Rozzi (now Associate Professor in the Department of Philosophy and Religion Studies at the University of North Texas and Investigator at the Institute of Ecology and Biodiversity in Chile) is recognized by his peers as having played a central role in creating Omora Ethnobotanical Park and the UNESCO Cape Horn Biosphere Reserve. The park itself hosts a Miniature Forest Garden trail that showcases the region’s mosses and liverworts (the Magallanes region has the highest diversity of bryophytes in Chile), promoting the value of native biodiversity amongst a spectacular backdrop of forests, fjords, and mountains. The region is also home to the Yahgans, the indigenous people with whom Rozzi has worked closely with, as Darwin himself did a century and a half earlier. Rozzi’s approach combining the human and biological dimensions of place has led to a variety of programs, partnerships, and initiatives that promote biocultural conservation through ecotourism, study abroad programs, research, and guidebooks including a Children‘s Illustrated Dictionary of the Yahgan World. An interconnected social and ecological system perspective is reflected in Omora Ethnobotanical Park’s goal – to link scholarly work with a long-term commitment to a place, thereby allowing academics to become engaged citizens as well as researchers – as well as in the park founder’s vision of – socially relevant science that focuses on research, education, and conservation, as embodied in the park’s mission statement: Integrating biocultural conservation with social well-being from the end of the earth. The Science and Practice of Ecology & Society (SPES) Award is an annual award that recognizes an individual or organization that effectively bridges scholarly work on the science of human-environment interactions with practical applications. The award of 1000 Euro includes an article in Ecology and Society devoted to the recipient and written by those who send in the nomination.